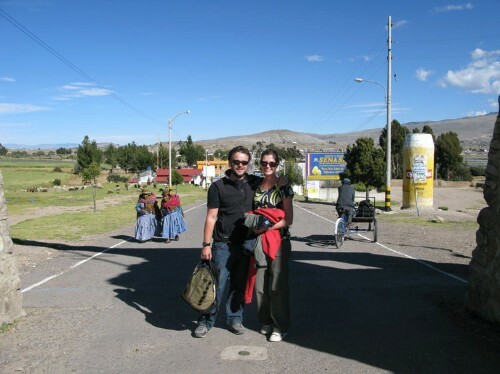 MATT: A long day ahead of us on the INKA Express bus from Puno to Cuzco - the heart of the Inca empire. The tourist bus is a nine hour trip (about three hours longer than absolutely necessary) which stops at several interesting spots along the way. Pukara (3879m) - A museum of Inca ceramics where it is explained about the differeing levels of Inca existence.The underworld - the world of the snake; the world around us - the world of the cougar; the sky and the high mountains (the world of the gods) - the world of the condor. This is all very interesting and we see some very old and interesting carvings.We also learn that this village is the origin of the small carved pair of bulls that we see sitting on top of many buildings in Peru, they are apparently to bring good luck. La Raya (4335m) - The highest point on our journey (and a tourist trap selling loads of tat on the roadside) but gives an amazing view up through the valley to a glacier in the high Andes. This is also the border between Puno and Cuzco districts. Sicuani (3540m) - Lunch. A little roadside restaurant on a very busy main road in the middle of the small village. We are given a very nice Andean buffet - lots of potato soup and other Peruvian specialities (no Guinea Pig here though). Kelly is harangued to buy some Llama tat - but she manages to resist. Raqchi (3475m) - A great stop at the temple of Wiracocha, which is an Inca village and temple to the sun god. There are amazing examples of Inca architecture and masonry everywhere here, and of the government of the Inca. The whole place is basically a huge food store so that the Inca empire would be able to survive in times of famine - very impressive. Andahuylillas (3093m) - a bit pointless and another tourist trap where you can pet guinea pigs and baby llamas and buy loads of Peruvian tourist tat. Most of our fellow passengers lap this up, but I lose Kelly 'cause she has climbed back onto the bus to read her book. Cuzco (3400m) - The centre of the Inca world, where we jump of the bus after being pretty unimpressed with the outskirts of the city which are more than a little run down. But we are quickly picked up by the driver from the guest house we are staying at - "Torre Dorado", which is super nice and run by a lovely lady who couldn't be more helpful. Cuzco is also relatively low, so we can breathe fairly easily compared to where we have been for the last couple of weeks. We are going to be in Cuzco for a couple of nights before heading to Machu Picchu - which is very exciting. We have read a lot of bad things about Cuzco "muggings and strangle rapes are frequent" says the guide book - nice! So we make the most of the free taxi service that the guest house provides and stick to the touristy areas. The town centre is actually quite beautiful and is dominated by a very grand colonial plaza and cathedral, with lots of very pretty streets and squares with churches, running off it. Every now and again we come across an Inca wall. We pay a few Soles to a street hustler who tells us about the amazing Inca masonry and the inferior Spanish stonework opposite - "this is Inca building, and that is Incompetent building". We spend the afternoon wandering around the town centre, round the pretty San Blas district and around the Church of Santa Domingo, which was built on the ruins of the Qorikancha - The Temple of the Sun. Big parts of the colonial church have been stripped away to reveal the very impressive Inca ruins below. Again it is amazing to see the Inca stonework, which no one has since been able to replicate. In the evening we head out for dinner and end up in a bar that could easily be London or New York. Right in the centre of Cuzco and the bar is chic and full of English speaking tourists. Compared to Bolivia, the Peruvians have got things well and truly switched on for the tourists.We sit at the bar and have a very nice meal, tapas style, with a few glasses of wine. Unfortunately Kelly is not satisfied by the first course and feels the need to order more. Out comes the confit of guinea pig. It is actually not too bad, not really tasting of much at all. But at least we have had the national dish of Peru. Give me haggis any day.